Andre Ward produced a dominant performance to beat fellow American Chad Dawson in 10 rounds and retain his WBA and WBC super-middleweight titles. 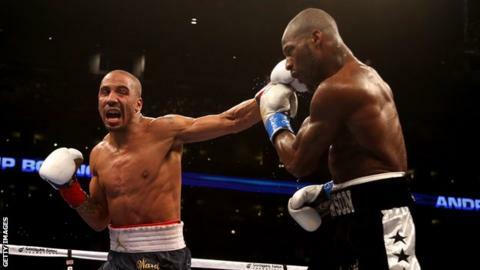 Dawson was put down in the third and fourth rounds and despite beating a count when he went down in the 10th, Dawson signalled he had enough. The victory in Oakland was a 26th successive win for unbeaten Ward, 28, who beat Carl Froch in November 2011. It was the first time in three years that Ward has won with a stoppage. "These kinds of fights, you've got to take risks. You can mess around and lose your title to a fighter of that calibre," he said. "I love to win. Finishing guys is the last piece of the puzzle." World light-heavyweight champion Dawson, 30, had dropped down to the 12-stone division for the clash. After the fight he confirmed he will be returning to the light-heavyweight division.